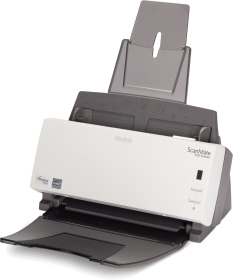 The recommended Kodak ScanMate i1120 is perfect for our business - compact and extremely quick throughput! 5 out 5! Greetings! I highly recommend this scanner. Like other comments on this site, I am gradually decluttering my filing cabinet, and storing old stuff in searchable B&W pdf files. Also handy gadget for converting your prints to jpegs. PROs:Stable, efficient, small footprint, regular updates from Kodak website, but original disk software still needed, duplex, colour, OCR software, multiple file formats, very configurable. Instinctive interface once set up the way you like it. CONs: Ocassionally software/drivers get themselves in a twist but a reboot solves the problem, or doing Cont-Alt-Delete and terminating KSSE.exe and KSSCFG.exe from the Processes list. Occassionally loads 2 sheets at a time, but this problem is solved by blowing air between the sheets before loading them in small batches. Its a real pity you can't use this gadget to OCR custom made forms straight into Excel fields. Firstly I must thank Tradescanners for their superb service. Do not have any doubts about dealing with this company - they are top notch. You can speak to people if you need to, they are cheerful, polite, and very helpful. I had a huge problem with the software supplied with the first scanner that I bought, it completely messed up my computer (no fault of Tradescanners) - they were brilliant and allowed me to change machines to this one, with came with different software. I am very pleased with the Kodak i1120 - it is a brilliant bit of kit - it just does the job efficiently, is easy to set up, and easy to use. I am now on my way to a paperless office and scanning all my client files into the computer. A happy customer - happy with the machine and very impressed with Tradescanners - so rare to find a firm that gives good service these days. We bought this scanner a few weeks ago after seeing it mentioned in an completely unrelated "news roundup". My initial thought was that it was too good to be true especially when I saw the price! The machine arrived and was up and working within minutes. Installation was very easy and the documentation is comprehensive although nobody in the office has actually got around to reading it other than the "quick set up guide". The scanner is incredibly fast and the noise level quite low. The scanner is really small and portable and we tend to pass it around the office as, once you have installed the disks, it is very quick and easy to use. We regularly scan double sided documents which save to the computer as PDF’s (our choice, not a requirement) and what used to be a laborious job is now done in a few minutes for quite large files. One thing to note, the double sided format is the default so unless you want blank pages, you need to remember to change to single sided if necessary. I have had this scanner for four months took me some time to decide which product was more suitable for me, this scanner is definitely the right choice. I have found it easy to use within short time it was installed, instructions are straight forward. The scanner takes little space on my desk is quite fast, I am able to convert all my paper documents in PDF format in just a few clicks of the mouse. As far as now I had no paper jams. This scanner is an excellent solution for home and office use. I’m very happy with this scanner – it was simple to set up, and it does almost everything I want it to. It can’t handle very heavy A4 paper (over 200 gsm), but everything else it manages admirably. I have put several thousand documents through already and only had a handful of problems – it rarely double feeds. There was a small issue with the version of the software supplied with the scanner, though this was fixed with one call to support and a download. I’d happily recommend this scanner. Ordered through tradescanners for excellent price. Very good service, next day delivery. Delighted with this scanner - no nonsense setup, very fast scanning. Automatically creates multipage pdf's from as many pages as are loaded into the feeder. Sheets of different sizes run through the feeder - receipts mixed with statements and printouts. Ideal to be bundled with Paperport 11 - although takes some getting used to using with the Kodak scanners page control window. User can select whether to display the Kodak scanner window or not (choose to display if you want to scan both sides of a document, uncheck if you just want one side scanning). Pdf's from within Paper port can be drag and dropped to combine separate scans and then order the pages at will. Delighted with this purchase which is already making a home office so much less of a clutter. I had a good flatbed scanner which just took so long to input pages of material. Will now insist on one in the work office. The Kodak ScanMate is a superb piece of equipment that I would without doubt recommend. We run a paper-less office, so documents are typically delivered by post. These are then scanned (in our case to pdf) directly into our 'back-office system, but there is the option of tiff, etc. We have been using a multifunction HP machine for a few years, but it is not duplex and it is so slow when compared to the Kodak scanner. The scanner is duplex, so for the documents that come with both sides printed on then no problem; the scanner 'eats' these as quickly as scanning a single sided document. The document feed works very well, taking a single page at a time from a large batch. As previously stated - it scans very quickly, accurately and will even automatically straighten pages! As an added bonus, there came bundled with the scanner PaperPort (database software), OmniPage (optical character recognition software) and Presto!Bizcard (software for scanning and storing images of all your business contacts). If you were to purchase the software 'stand-alone' it would probably cost more than the scanner! I used OmniPage to scan a 100 page document and convert it to a word document - it was about 98% successful, the only problem being the fact that where any pictures were present it got a little confused, but that being the only issue, its not a problem. This is without hesitation a 5star product and now a piece of technology that we could not work without. The Kodak ScanMate i1120 has been a great addition to my office. It is a very well built machine which has proven to be solid and reliable. It was easy to set up and is very easy to use giving good quality scans at a very high speed. It has saved a great deal of time and has allowed me to move a step closer to a paperless office. Highly recommended. Just push the button and organize your paperwork—easily! The new KODAK SCANMATE i1120 Scanner transforms your paper documents into high-quality digital images that can be managed, sent, filed, and found—easily. One push of a button puts you in control of your documents and organizes your information. The KODAK SCANMATE i1120 is ready to scan right out of the box, with one simple computer connection and intuitive bundled software. With the smart touch feature, you can easily preprogram up to nine scanning functions, along with the file formats you need them in (PDF, TIFF, JPEG, RTF, and searchable PDF). Scan anything from a business card to documents up to 86 cm (34 in.) long, in color, grayscale, black and white, one-sided or two. Even when they're imperfect, Perfect Page technology can make scanned images look better than the originals. This robust desktop scanner gives you all the ease, flexibility, reliability, and quality you want, at a price that's just where you want it.